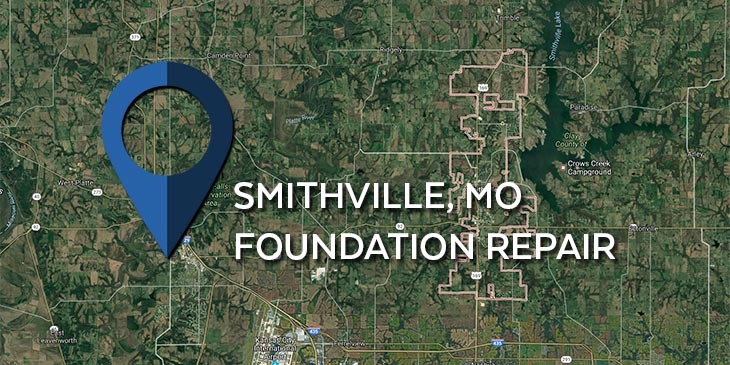 The residents of Smithville, MO know that when they need a foundation repair specialist they can always come to KC Pro and we will gladly be of service. We proudly service foundation repair and also the other cities in the surrounding area. Smithville has a population of around 8,500 according to the 2010 census. It is located in the Northwest region of Missouri along the Little Platte River in both Clay and Platte counties. The residents here know that they can count on K.C. Pro to complete their foundation repair needs. Our professionals keep the customers’ satisfaction their number one priority all the way throughout the project. Foundation problems can be stressful for homeowners especially if you do not know what the problem is. Sometimes you don’t even know that there is a problem with your home’s foundation. There are some general signs that you can look for in your home to tell if there is a possible foundation issue in your home. The common signs are: sticking doors or windows, cracks in your walls, leaning chimneys, gaps between the frame and the door or window, or cracks in your foundation. These are not the only signs, but these are a few. If you find that your home is dealing with some of these issues, then you need to contact a professional as soon as possible. Our professionals at KC Pro will come and give you a free estimate when they come and inspect your home. You need a professional to come and inspect it because your foundation problem may have caused more issues than you have realized. Along with foundation repair, we also provide basement waterproofing services in Smithville. We have a variety of waterproofing services to help you with your waterproofing issues. Whether you need exterior waterproofing or wall crack injections, we can help. Let us handle your basement waterproofing problems so you don’t have to. We want to provide you with whatever foundation repair needs you have. Since we are a full foundation repair company, we do it all. Contact us today so we can get started.